Summary: For her graduation from high school in 1920, Frankie Pratt receives a scrapbook and her father’s old Corona typewriter. Despite Frankie’s dreams of becoming a writer, she must forgo a college scholarship to help her widowed mother. But when a mysterious Captain James sweeps her off her feet, her mother finds a way to protect Frankie from the less-than-noble intentions of her unsuitable beau. In the past few months, I have really been trying to accept less pitches for books. I already have a basement full and I just don't seem to be reading at the same pace as last year. However, when I received an email about the new novel THE SCRAPBOOK OF FRANKIE PRATT: A NOVEL IN PICTURES by Caroline Preston, I couldn't help but jump at the chance. THE SCRAPBOOK OF FRANKIE PRATT is just that... a full color novel in the form of a scrapbook.I was definitely intrigued by the concept and I was a little curious to see if an actual story could be told entirely in the form of a scrapbook. And just in case you're wondering, THE SCRAPBOOK OF FRANKIE PRATT is most certainly a novel; and a very good one at that. This unique book told the story of Frankie's life from her high school years, to her college years, to her time spent in Greenwich Village, to her days in Paris, and then finally to the time she returned home. There were descriptions of Frankie's life as well as the places she lived; and most impressively, Frankie managed to be a very well-developed character. I was actually blown away by the entire reading experience. This is definitely a one-of-a-kind read -- and a must-read at that. THE SCRAPBOOK OF FRANKIE PRATT is in one word...amazing! The book really, truly looks like a scrapbook of a young woman's life; and it also does a remarkable job of telling a story. I admit that I wasn't expecting quite as much from this novel. Each and every page of this book has full-color vintage memorabilia in addition to Frankie's journaling entries. I don't know what I appreciated more about this novel --the collection of interesting scrapbook pieces or the story of Frankie's life. Frankie was just a fabulous character and I felt as if I got to know her extremely well through her scrapbook. She was an ambitious women in the early 1920s; and due to her family's circumstances, she appeared to be trapped in her small hometown rather than being able to attend college. When her mother "finds a way" to get the tuition money (hint: it involves a romantic fling with a questionable character), Frankie heads to Vassar college and experiences a very different life. She meets all types of women, including Edna St. Vincent Millay, and even some interesting young men. She also grows up a lot! After graduation, Frankie heads to Greenwich Village to try her hand at writing based on "Vincent's" recommendation. She learns just how hard it is to make it in New York City as a young woman in the 1920s, and eventually heads over to Paris on the S.S. Mauritania. She makes a go of it in Paris -- even meeting up again with her first love -- until she has to return home to help take care of her mother. Through all of her adventures, Frankie eventually realizes that home truly is where the heart is! In so many ways, THE SCRAPBOOK OF FRANKIE PRATT is a very special coming-of-age story. THE SCRAPBOOK OF FRANKIE PRATT is one of those books that you could read over and over again. In fact, after I finished it, I went back to the beginning and started skimming all of the images again. I think my first go-through was more about the story of Frankie's very interesting life. While later, I appreciated all of the memorabilia that Ms. Preston managed to arrange so creatively in the book. Reading THE SCRAPBOOK OF FRANKIE PRATT might have ruined historical fiction for me because it such a fun way to experience learning about past events! There is no doubt that Ms. Preston spent an incredible amount of time and effort into finding just the right memorabilia, and I was incredibly interested in looking at all of the items. Evidently, she spent a lot of time on ebay! I loved seeing the 1920s advertisements and photographs, but it was just as much fun reading about Frankie's impressions and seeing her thoughts and dreams in her "own handwriting." 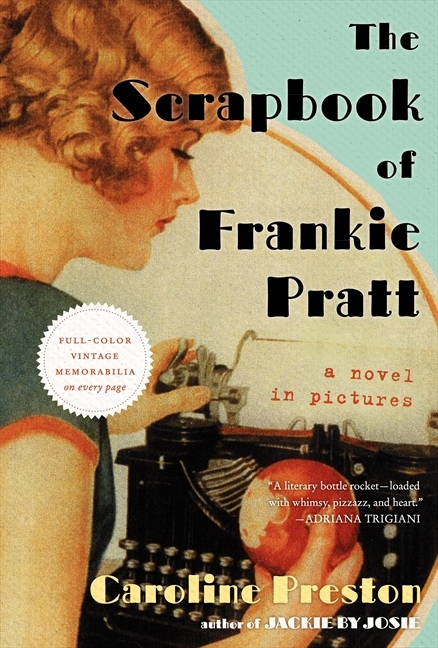 THE SCRAPBOOK OF FRANKIE PRATT is a book that will appeal to all types of readers and all age ranges, and I already have a list of people with whom I want to share this novel! Just check out this video to get a closer look at THE SCRAPBOOK OF FRANKIE PRATT and tell me that it doesn't look fantastic! I really can't say enough about THE SCRAPBOOK OF FRANKIE PRATT. It was an intriguing story with a loveable main character. Plus the format was unlike anything I've ever seen. I absolutely loved it and it's a book that should not be missed! I just loved this too -- as you know. I love the sound of this! What a creative, fun book that definitely sounds like one I just have to own! This is the first I have heard of this book. I think this is a book I would love to read. I love scrapbooks and nostalgia so this would be right up my alley. I will be looking for this book! Great review! This one sounds really good...and unique. I'm sure it's one that is much better read in print than on my ereader. Guess I'll have to actually get up and go find it! Thanks for pointing it out. This sounds very fun. I love books that try out new formats! This sounds intriguing. I like that its in one of my favorite formats -- a scrapbook. I'd love to check this out. I've put this at the top of my pile after your raves. I'll be reading it next. Y'all are so lucky to receive advance copies of this. I can't wait to get my hands on it! I can't wait to read this one! I have it on my wish list so hopefully I get a copy for Christmas! This is the second review I've read, and now I know I must see this book in person at some point! Oh I've heard such amazing things about this. I really want to read it. Glad you enjoyed it! Yes, a unique novel - very well done! I'm so impressed that all scrapbook bits are authentic finds (no photoshopping). We're looking forward to hosting Caroline Preston at the bookshop next month; I'm sure the audience will have lots of questions/discussion about her writing and her craft.